The founders anticipated circumstances like this, which is why they outlined the impeachment process. The attorney general of the United States is a civil officer. If he has lied under oath to the Senate, that act demands impeachment. After news reports published last Wednesday made it clear that Jefferson Beauregard Sessions III had deceived the Senate regarding his interactions with Russian officials, there were immediate demands that the attorney general recuse himself from investigations into issues relating to those lies and that he resign as the nation’s chief law-enforcement officer. Sessions announced Thursday afternoon that he would recuse himself from any examination of Russian involvement with President Trump’s campaign. But he gave no indication that he would consider the next necessary step of removing himself as attorney general. Sessions has made his position clear. This lawless attorney general is not going to do the right thing, so Congress must consider the prospect of impeachment. The founders anticipated such circumstance. This is why they outlined an impeachment process. Here’s why: The Washington Post has revealed that during the 2016 presidential campaign, when Sessions was a close counselor and top surrogate for Donald Trump, he spoke twice with Russia’s ambassador to the United States. Sessions acknowledges the meetings now. But when he appeared before the Senate Judiciary Committee as Trump’s nominee for attorney general in January, Senator Al Franken asked how Sessions might handle revelations that individuals associated with the Trump campaign had communicated with the Russian government. In January, Sen. Patrick Leahy, D-Vt., asked Sessions for answers to written questions. “Several of the President-elect’s nominees or senior advisers have Russian ties. Have you been in contact with anyone connected to any part of the Russian government about the 2016 election, either before or after election day?” Leahy wrote. We now know that was not the case. 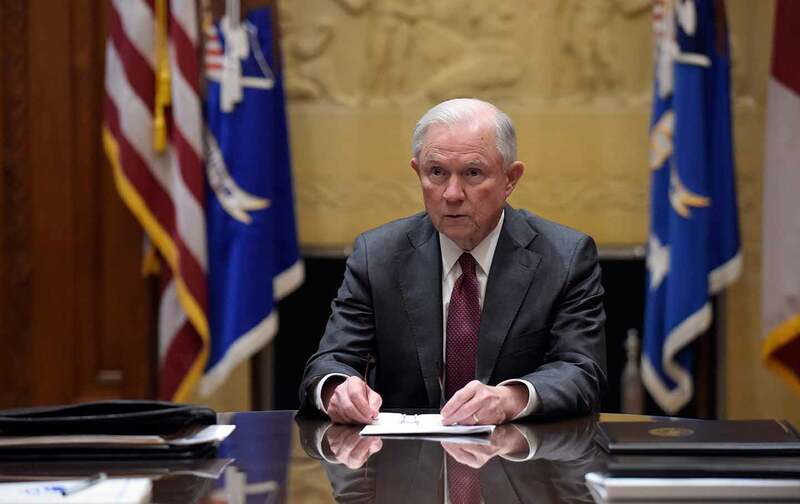 And, unless Sessions is far too absentminded to continue to serve as attorney general (a circumstance that no one seriously entertains at this point), then we have been handed evidence that this man engaged in a blatant attempt to deceive the very Senate that was charged with determining whether he would take charge of the Department of Justice. So what? The issue isn’t whether Sessions spoke with the ambassador. Nor does it matter whether he did so as a senator or as a Trump surrogate. He was both. What matters is what Sessions told fellow senators when he was asked straightforward questions. He volunteered, “I did not have communications with the Russians.” He replied “no” to a direct inquiry about whether he had such communications. If these were not overt lies they were, at the very least, legalistic attempts by Sessions to deceive colleagues who were charged by the Constitution with a duty to provide advice and consent regarding his nomination to serve as the nation’s chief law-enforcement officer. The decision by Sessions to recuse himself addressed concerns about his personal involvement tainting specific investigations. But it did not address the issue of Sessions’s lying to the Senate. Senate Democratic leader Chuck Schumer agreed. True enough. But Sessions is not about to resign. And his record does not offer any indication that he intends to start telling the truth. The founders anticipated such circumstances, which is why they wrote a constitution that outlined an impeachment process. The catch-all phrase “high crimes and misdemeanors” was intended to give guardians of the republic leeway for holding presidents, vice presidents, and cabinet members to account. An impeached official is not charged by a prosecutor and tried in the courts; nor is he or she jailed or fined if found guilty. An impeached official is charged by the House of Representatives, tried by the Senate, and removed from office if convicted. The signers of the Constitution did not intend that this tool would be used only by the opposition party; the intent was that all members of the House and Senate might rise above partisanship and ideology when it came time to defend the American experiment. And, while no one is naive about the level of partisanship in today’s Washington, no one should make excuses for House members or senators who fail to rise above it. Jeff Sessions disrespected the basic premises of that experiment and disregarded the Constitution. He did so in pursuit of a position: that of attorney general of the United States. He obtained that position under false pretenses. It is now time to relieve him of his responsibilities as the nation’s chief law-enforcement officer. The tool, impeachment, is at the ready. It should be employed by all members of Congress who believe that constitutionally defined oaths must be upheld.